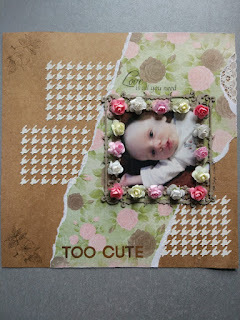 I had to think of three ways to add roses to the layout. I knew I had a stamp and I found some paper to use and the little flowers were easy, though I wasn't sure if this many around the border was too many or if it was ok. I went with it anyway! Little bit of lace and some houndstooth modelling paste. 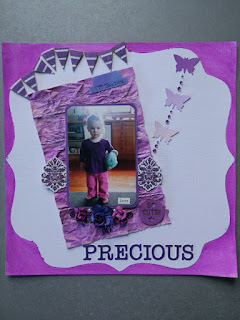 I used one of my purple gelatos with some water to create the shaped border. I punched out the butterflies from some paint samples I had used for another challenge months ago and added some bling. The page behind the photos is the same gelato on a page from an old book, with a few flowers and stickers added on. I even managed to figure out a word for the title from some shiny purple alphas I have.